Lee has been making denim work clothes since 1889 and with sixty or so years of producing jeans for casual wear, you can rely on them to know how to make a decent pair of jeans. 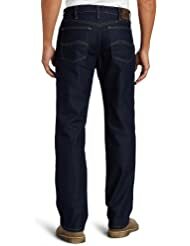 Although their range doesn't extend to a 38 inch inseam, tall men are well catered for with a wide range of 36 inch inseam jeans. When I checked their website in April 2016 to update my original article written in 2012, jeans could be selected according to inseam as well as waist so you can drill straight down to your size - it shows how much better sites have got in the last few years and is a rare example of shopping getting easier for tall people! If you're after bargains and a range of styles no longer available at the Lee web site, you can also try sites like the Amazon Denim Store and Sierra Trading Post. Examples below are ones that are (at the time of writing) retailed on discount at Amazon. With around three dozen styles of 36 inseam jeans in a wide variety of washes, Lee Jeans offer decently-priced quality denim from a recognised brand.